"The five houses of the Successor States employ both warfare and treachery in their efforts to gain control of the interstellar empire once known as the Star League. 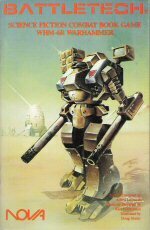 Huge, man-like, walking tanks called BattleMechs rule the battlefields, but intrigues and plots rule the imperial courts. Hanse Davion is Prince of the Federated Suns, the largest of the five warring Houses... an idealistic man who has had to learn that politics Is neither honorable nor straightforward. Ardan Sortek is the commander of Hanse Davion's personal guard. Although a long-time friend of Hanse's, he has not yet learned the lessons of power. Through a chance series of events he stumbles upon a plot of such magnitude that it threatens the balance of power of Inner Sphere. Unfortunately, no one will believe him... Indeed, they think he is quite mad. Is Ardan crazy or is someone trying to kill Hanse Davion?" Here is Natasha Kerensky, the infamous Black Widow, in one of her unit's first and most daring missions... a deadly mission of revenge against Anton Marik, the rebel of the Free Worlds League." CONTRIBUTORS: Gideon; Scott Oehler; David Detrick. This collection of short stories are fragments, unexpected bits of life and death in the Inner Sphere. The sudden salty taste of blood. The acrid smell of scorched metal. A hot cup of coffee after a long night's battle. 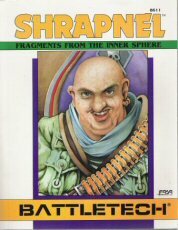 Shrapnel is images and experiences frozen in the mind of the observer." CONTRIBUTORS: Jordan K. Weisman; Ken St. Andre; William H. Keith, Jr; Elizabeth Danforth; Michael Stackpole; more. "In the 31st Century warfare is common. But whatever world the battle is on, the battlefield is dominated by one weapon: the BattleMech. 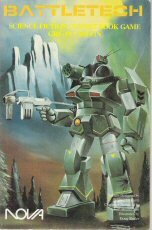 Heavily armed and armored, these vaguely humanoid fighting machines are virtually unstoppable — except by another 'Mech. The men and women who pilot them, the MechWarriors, are the elite of a military society. Now you can find out what it's like to pilot a 'Mech — from the inside! 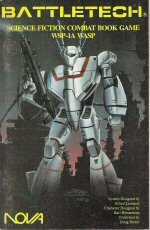 Each page of these books gives you the view from the cockpit of your 'Mech as you face off against another of these awesome machines. The controls are in your hands; the choices are yours!" 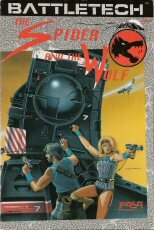 Released by NOVA years ago, the set contains 6 "Lost Worlds" format battle books: SHD-2H Shadow Hawk, GRF-1N Griffin, WSP-1A Wasp, WHM-6R Warhammer, LCT-1S Locust, RFL-3N Rifleman. From this vantage point you have a perfect view of the enemy's approach. Picking up a heat source at long range, you activate your weapon systems. The combination of Autocannon, Long Range Missiles and Medium Laser gives firepower at all ranges. That plus your maneuverability should give you the edge — depending, of course, on what is coming through the high pass below. In the 31st Century warfare is common. 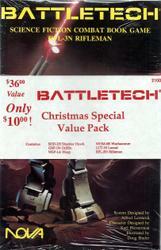 But whatever world the battle is on, the battlefield is dominated by one weapon: the BattleMech. 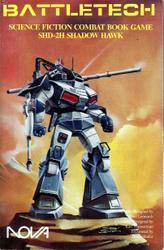 Heavily armed and armored, these vaguely humanoid fighting machines are virtually unstoppable — except by another 'Mech. The men and women who pilot them, the MechWarriors, are the elite of a military society. "You've been monitoring these woods for several days now, with no sign of enemy activity. Suddenly you catch a glint of metal across the glade. The familiar hum of your PPC fills the cockpit and a solid click indicates your missiles are ready. Range is to your advantage but will that be enough to defeat this opponent?" "The new-made ruins of the city have been unnaturally quiet during your patrol. You alternate between speed and caution, picking slowly through the rubble and then darting across the open spaces. Suddenly, the building beside you explodes from weapons fire. Laser ready, missiles loaded, you leap into the courtyard. Can your speed and agility outwit this unknown foe?" "Again, you're first out of the DropShip. Scanning across the burning desert, you can see no sign of the enemy. Can this landing really be unopposed? No! There, on the horizon! The unmistakeable dust cloud of approaching 'Mechs. Powering up, you move out. Can your awesome firepower defeat these unknown foes?" "Approaching speeds of 130 kph, your 'Mech is one of the fastest machines on the battlefield today. Few opponents, however, suspect that your Locust has a bigger bite than most. Yours is the 1S variant, with machine guns stripped out and replaced by a pair of hefty SRM 2 packs. Your next opponent has a nasty surprise waiting for him..."
"The world you defend is hot, the atmosphere barely breathable. 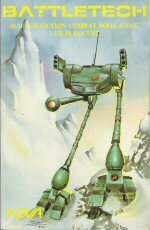 Most 'Mechs dread worlds like this, but you have fewer problems. The combination of large lasers and autocannon allow you to manage your heat buildup better. Suddenly, you spot a gleam of metal in the distance. Your on-board computer does not recognize it as a friend. You fire a burst of lasers..."